Doughnuts and pizzas are part of the April 15 discounts. 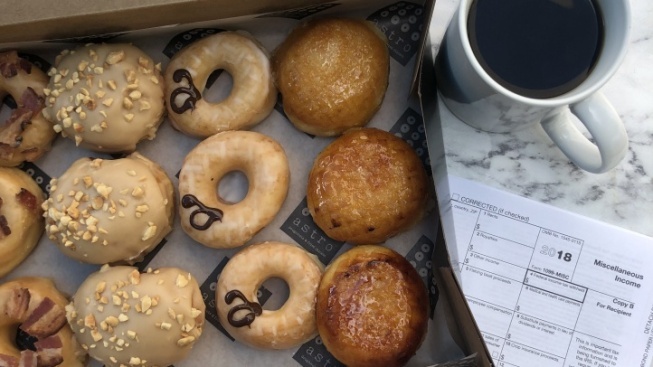 Astro Doughnuts & Fried Chicken will offer a box of dozen mini doughnuts for $10.99 on April 15. File that all under "hunger-building" and "thirst-creating," for sure. 1933 Group: Stop in at Big Foot Lodge, La Cuevita, Idle Hour, Highland Park Bowl, Thirsty Crow, Harlowe, Sassafras Saloon, and Oldfield's Liquor Room on April 15 from 5 to 8 p.m. (4 to 7 at Idle Hour) for a special drink priced at a dollar. It may be an Old Fashioned, Tequila Press, or Moscow Mule, depending upon the location. Grand Central Market: Need a thirst quencher of the citrussy sort? Horse Thief BBQ will have lemonades for a buck each, all day long on April 15. And at the market's Olio Wood-fired Pizzeria? If you say "Olio, please eat my tax" on April 15 they'll shave 10% off your bill. Farmer Boys: Will you be near a Farmer Boys on Tax Day? You'll be able to net two Breakfast Burritos or two Double Big Cheese for, yes, $10.40. That's all day at all participating Farmer Boys. Which ones are in the loop? Look here. H Café: The Koreatown restaurant will have a number of drink deals going on April 15, including a six-dollar Death & Taxes cocktail. Canned beers are priced at three bucks on Tax Day and Old Fashioneds at $6. Prank: Looking for a bit of luck on April 15? The magical deal-filled wheel'll be up at this DTLA spot, meaning you can spin it and, fingers crossed, "land great deals on cocktails, ranging from $1-5!" BJ's Restaurant & Brewhouse: In a cheesy, saucy kind of mood as Tax Day 2019 rolls in? You can get a deep-dish BJ's pizza for half off, oh yeah, or half off on a Tavern-Cut Pizza. The details. Jane Q: Perhaps you spent the weekend going over a 1040 form? If you're in Hollywood on April 15, you can swing by this stylish Hollywood hangout and order a pizza and draft beer for $10.40. Here & Now: Hoping to extend the Tax Day drink deals by a few more days? This DTLA favorite is closed on Mondays, but if you visit April 16-19 you can enjoy a shot of Catocin Creek rye for $4.15.